Greg Sturino and I met up with good friend and west coast photographer Jeremy Condamine in the Bronx, then headed out to some spots. We decided to warm-up on this kinked handicapped rail, which is a famous NYC spot located near Fordham University. 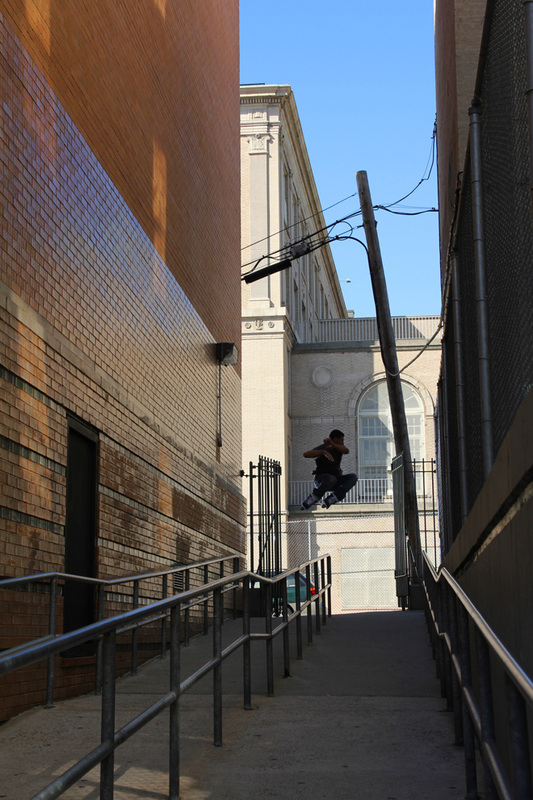 The rail has been featured in several NYC videos such as “1131,” “Nature ONE,” and “Urban Royalty.” This place is a great warm-up spot, not only because of the perfectly mellow, kinked handi, but also the waxed up c-ledge at the bottom. Most choose to skate this rail from top to bottom, but Greg laced this trick going the other direction. As the rail launched him out onto a large sidewalk, Greg laced this bomb 360. I was able to time the shot perfectly to show the huge air he caught. Shot with one strobe up and left beyond the gate. Easily one of the most underrated skaters out atm. More press on this guy. So is this grind up to 360? What grind? Or is he launching out of the slope? Back Farf… says it on the picture. And he was flying… no grab… no problem.